act as a seal to prevent foreign objects/debris from entering the joint opening. allow for the natural creep and shrinkage of concrete. When using concrete as a building material, there are some very important things to consider. Of course, the strength and weight load of the concrete are important, but another vital component is the affect the environment has on the material. Thermal cycles within the geographical area must be taken into consideration. As seasons and weather change, the structure will expand and contract with the temperature. Sometimes, this is overlooked, and when these structures expand and contract, there can be serious issues with the expansion joint system. The heating and cooling cycles of concrete bridge decks will cause expansion and contraction, respectively. If the contraction is greater than the tensile strength of the construction materials, cracking will occur. And inversely, when the expansion is restricted, distortion or crushing of the materials can occur. To prevent these types of failures, concrete bridge decks require joints fitted with materials that allow the structure to expand and contract without causing damage to the structural integrity. These are known as expansion joints, and there are many different types. Each of these joint types has a specific application method and set of parameters which must be followed to ensure the joint’s effectiveness. Proper sizing of the joint, along with an accurate assessment of the anticipated movement of the structure, must be considered when selecting the proper joint type for the intended project. Some other things to consider are substrate preparation, climatic factors, lane closure requirements, manufacturer requirements, physical properties and limitations of the joint material. 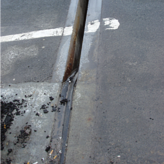 Many of the roads and bridges in the US have expansion joints which are structurally deficient. The main causes of failure range from tearing, separation of the seal from the substrate, snowplow damage, concrete deterioration, debris accumulation and improper alignment of deck sections. The majority of these failures can be attributed to improper installation or inadequate maintenance practices. 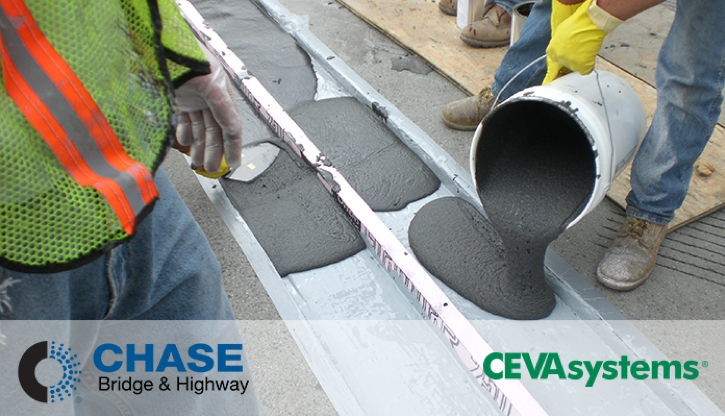 Chase construction products include a line of closed cell foam expansion joints as well as an elastomeric concrete used as the headers of joints to withstand traffic The CEVA expansion joint line of products is a custom fabricated series of expansion joint products and accessories used in a variety of applications. Please contact us for additional information.